In the 1860s, a Pottsville industrialist, named Charles Baber began purchasing tracts of land on the outskirts of the Borough of Pottsville adjacent to a small existingEpiscopal cemetery called Mt. Laurel Cemetery. The Borough of Pottsville was sparsely developed beyond Twelfth Street (then called Wood Street) and the tracts of purchased land ran from Twelfth Street to a then unnamed street which later became Sixteenth Street. One of the tracts Charles Baber purchased contained a large water reservoir. The purchased land, totaling over 50 acres, had a dual purpose: the upper section closest to Market Street was used for burial purposes; the lower section, which contained the reservoir, was used for recreational purposes of fishing, ice skating, and for picnics with the horses and buggies parked in the shade of the trees. Trinity Episcopal Church owned the adjoining and smaller Mt. Laurel Cemetery which they purchased in 1845 as forested woodland. The two cemeteries existed side by side until Charles Baber’s death in 1885. Upon Charles Baber’s passing in 1885, Trinity Episcopal Church was named as trustee of the Charles Baber Cemetery. In 1887, the Mt. Laurel Cemetery and the Charles Baber Cemetery were considered one large cemetery and garden park. 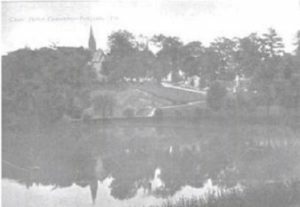 By 1945, the Baber Cemetery was mandated by the City of Pottsville to fill in the large reservoir because it flooded the city’s sewer system during heavy rains. Fed by natural underground springs, the reservoir remains as a small pond today. 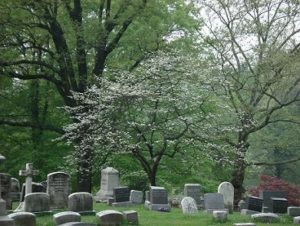 In 1966, the Pottsville School District, after outgrowing the nearby Patterson Middle School, purchased 25 of the cemetery’s 50 acres to build the D.H.H. Lengle Middle School, the large Martz Hall auditorium, and the parking lot. Because of the cemetery’s proximity to the middle, high, and elementary schools, it is often used by the school children as a conduit to and from their homes. Today, the Charles Baber Cemetery remains viable as both a cemetery and as a garden park. The garden cemetery is opened during daylight hours. Throughout the day, people can been seen jogging or walking on the paths; parents and grandparents may be pushing a baby stroller, or their child may be riding a tricycle; children are walking on their way to and from school; the chapel may be holding their summer church services; a funeral and interment may be occurring; mourners may be visiting a burial site; and other people may be sitting by the meditation area. The natural setting of trees, shrubs, grass and birds provide a quiet, cool, and refreshing respite from a busy day.